The warm loving vibrations of Mohanji’s “Power of Purity” meditation reached Kerala during this wet cold monsoon season in the month of August 2011. The first ever “Power of Purity” meditation in Malayalam was conducted in Mathruchaaya Balabhavan Chowara- near Kalady. Kalady is the birth place of Adi Sankarachaarya. Adi Sankarachaarya was a great Guru who spread the understanding of Adwiata (Non duality) all over India. His birth place was Kalady but He travelled bare feet from Kerala which is in the southern part of India to the north tip India up to Kashmir to spread the message. Divine had chosen Kalady in Kerala for Adi Sankarachaarya to begin the journey. Mathruchaaya means the Mother’s loving shelter. 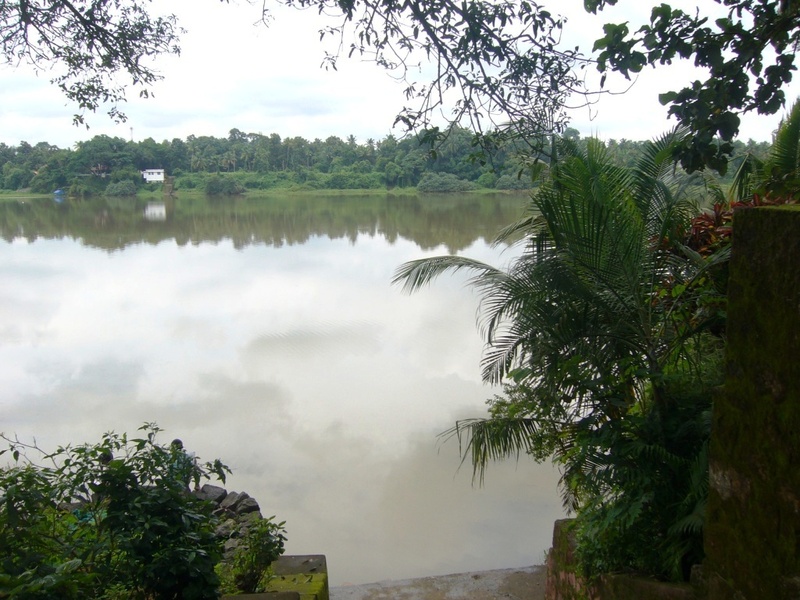 It is located on the beautiful banks of Poorna river or Periyaar. This orphanage shelters 85 boys. We visited the orphanage. The director welcomed our suggestion to conduct “Power of Purity” meditation followed by annadan (food seva) for children on 20th August 2011, Saturday. God dwells in innocent hearts. Children meditated beautifully. Saturday 20th August- It was raining since morning. During my morning prayers, I asked help from Masters. I received immediate answer, “We are going to work in a plane where there is no time or space limitation”. I realized that it is not just a thought, but it is a message from Higher Realms. To my surprise, what Master’s promised, it all happened exactly in the same way. The rain stopped. There was no problem with the electricity throughout meditation and Annadan. I had enough time to give Shaktipat to all children who attended meditation. I began with a brief speech about Mohanji and the ‘Power of Purity’ meditation. Meditation went really well. Presence of Mohanji and many other Masters was felt throughout the meditation. As I watched the kids innocent faces filled with bliss and happiness, I felt tremendous joy filling within me. I felt relaxed and lighthearted. It is very difficult to explain all that in words. At the end, the kids expressed their gratitude and told me that they enjoyed it. For The Hungry, Food Is God. 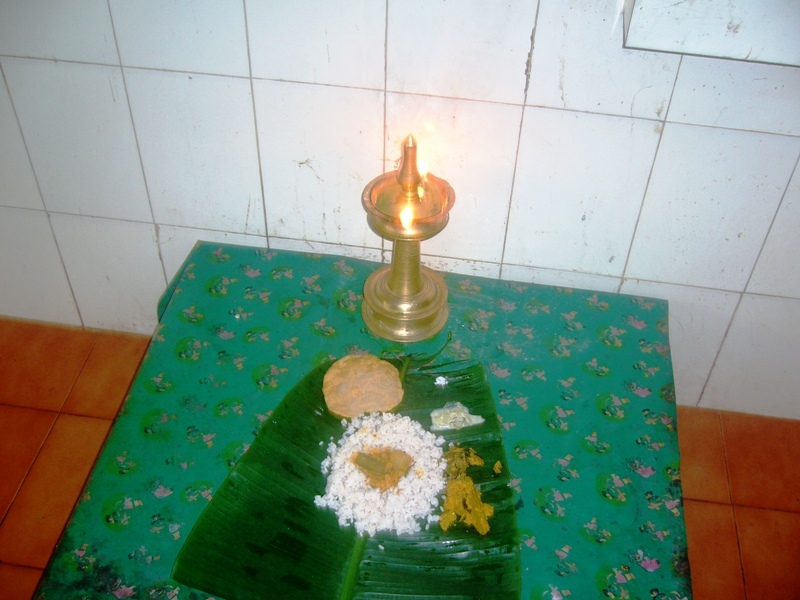 Kerala food served on banana leaf. The sincerity and discipline of kids during meditation and annadaan was remarkable. They kept perfect silence throughout my speech, meditation and annadaan. The lunch was typical Kerala style meals and the kid’s prayers before the meals brought tears to my eyes. They expressed gratitude to the providers of food, to the divine energy which give all food to world. Then they praised food as a Goddess. Finally they prayed “Loka Samastha Sukhino Bhavanthu”- Let all world be peaceful and happy. TRUE, they knew the value of food and they knew how to pray –By expressing gratitude to everything and everyone around them. Lovely kids. I enjoyed every moment which I spent with them. I was immensely glad that I got a chance to be with them. My heartfelt appreciation to the management for their sincere efforts to impart such good characters in the kids. There was another scene which touched me. One child called his pet cat before getting up and shared his food. He waited till cat finished food. It reminded me the ultimate truth which Lord always conveyed to us- “See God in all beings”. 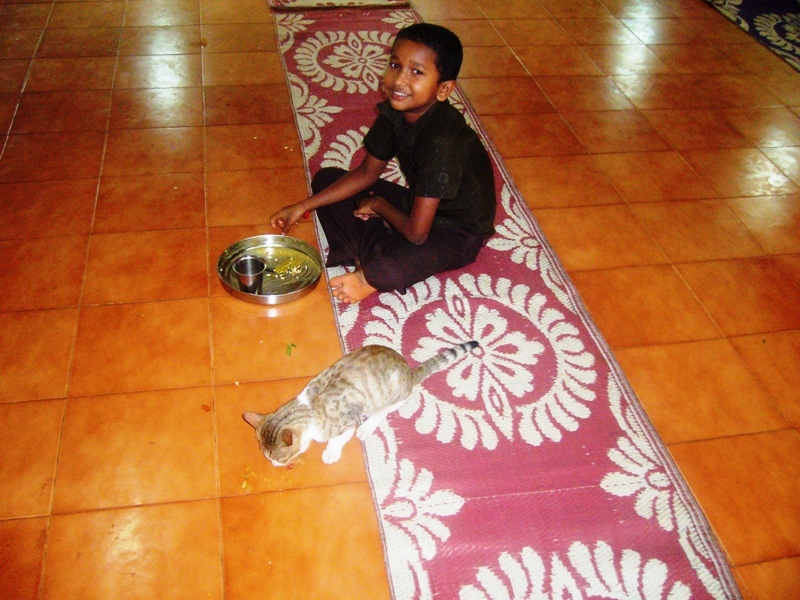 This small child showed it in a practical way by sharing his valuable food with his pet. How many people who live with all luxuries are ready to do this? Once again I was thankful that I got a chance to meditate with them. Masters always said, "See God in all Beings". This small boy actually lived it. My heartfelt gratitude to Mohanji, all the Masters of the Universe and all other people who are doing their part to spread his divine mission. My humble whole hearted pranaams.